Shimmery, spacious 80s-esque tone. High standard of construction. 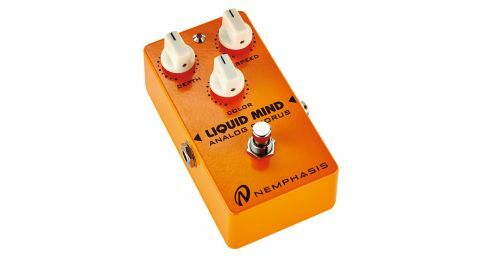 A true Bucket Brigade Device, Nemphasis' Liquid Mind harks back to the early 80s heyday of chorus pedals. For control, there are the usual speed and depth knobs, but there's also some useful tonal shading available via the Color control. "If you're specifically looking for vintage analogue mono chorus sounds, you'll find them here"
Sound-wise, we're in that 80s analogue chorus zone: put next to a vintage Boss CE-2 - pretty much a yardstick for mono chorus in compact pedals - the sound is very similar, with that familiar shimmer and spaciousness. Keeping the Liquid Mind's Color knob at a low setting mirrors the midrange warmth of the Boss, but turning it clockwise brightens the sound, imbuing it with a little more bite that could suit some musical contexts. While a multi-modulation pedal will give you a range of flavours, sometimes a focused single pedal can nail it better. If you're specifically looking for vintage analogue mono chorus sounds, you'll find them here, with a modicum of tonal control for added versatility.